Marketers are spying on Internet users - observing and remembering people's clicks, and building and selling detailed dossiers of their activities and interests. The Wall Street Journal's What They Know series documents the new, cutting-edge uses of this Internet-tracking technology. The Journal analyzed the tracking files installed on people's computers by the 50 most popular U.S. websites, plus WSJ.com. The Journal also built an "exposure index" - to determine the degree to which each site exposes visitors to monitoring - by studying the tracking technologies they install and the privacy policies that guide their use. 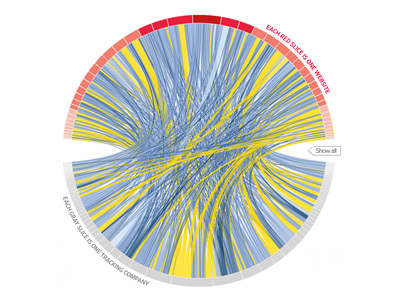 In this radial convergence diagram, the outcome of their study, red slices on top represent visited websites, e.g. 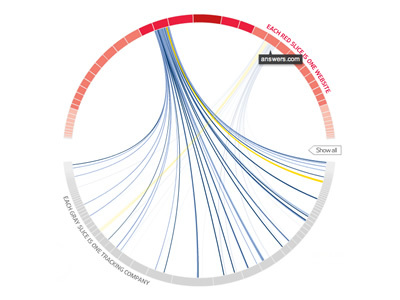 answers.com, yahoo.com; bottom grey slices represent different tracking companies (watchers); and tying them together are blue lines depicting different electronic tracker files.